Buffalo Chicken Nachos are easy to make, and they're perfect for a party or an easy dinner. Guaranteed to satisfy your hungry crowd! I was never big on nachos. I know - I'm weird. Who doesn't like nachos? It wasn't so much that I didn't like them, as it was that I didn't care one way or the other. A couple of years ago, however, I started making nacho recipes. I don't know why, but I found myself trying a new recipe every week for a few months. I have quite a collection going now. This one stands out to me, though. When I think of nachos, I think Buffalo Chicken. They are so good! Not just regular good, but that kind of good that will leave you wondering why you don't make them more often. Except for my vegetarian daughter, all of my kids and sons-in-law love these nacho. I'm sure you will, too! 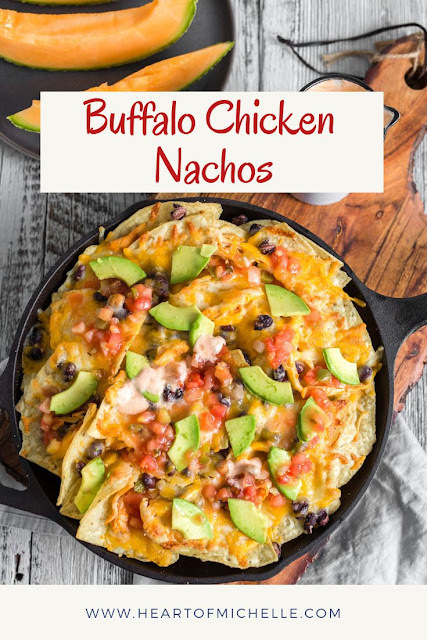 Whether you're entertaining friends, or just need to feed your family, you'll appreciate how easy this Buffalo Chicken Nachos recipe is. After that, it's just a matter of putting it all together. I'm listing the prep time as 20 minutes, but really, if you have a rotisserie chicken all ready to go, it doesn't take even that long. You can have this dish on the table in no time. 2. Stir together 1/4 cup wing sauce, lime juice, and salt, and chicken in a bowl. 3. Arrange half of the chips in a single layer on a parchment-lined baking sheet. 4. Top with half of the chicken mixture, half of beans, and half of cheeses. Repeat the layers. 5. Bake 10-15 minutes, or until cheese is melted. 6. Stir together sour ceam and 1/4 cup wing sauce. 7. 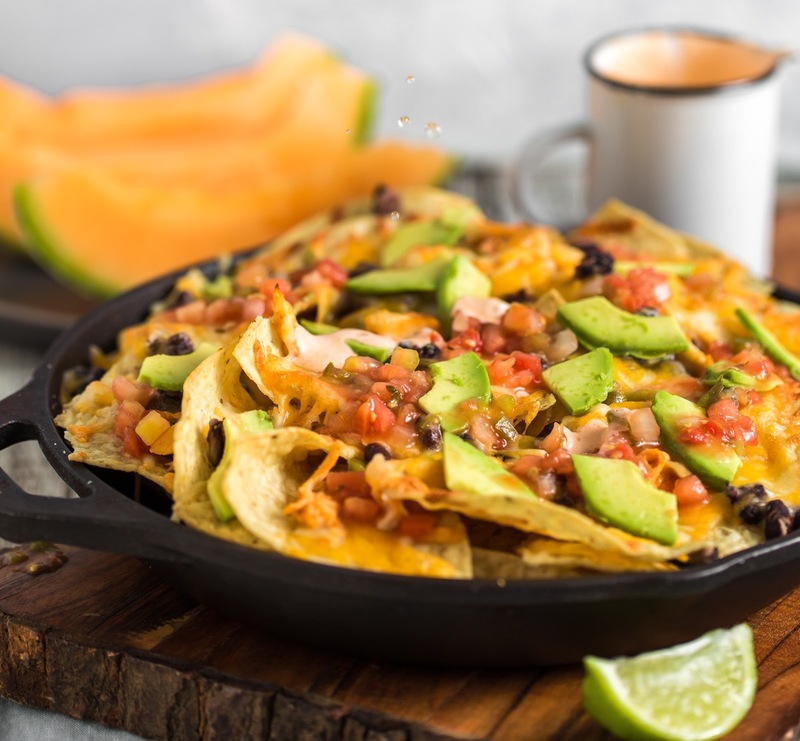 Drizzle over baked nachos. Top with avocados and salsa. What goes with Buffalo Chicken Nachos? Well-thought-out answer: I think this depends on how you're using the nachos. If it's an appetizer or game day food, then you'll probably make other appetizers to go with it. In the case of a meal, I like to add some sweetness to the savory. Having a variety of colors is also important for proper nutrient balance. 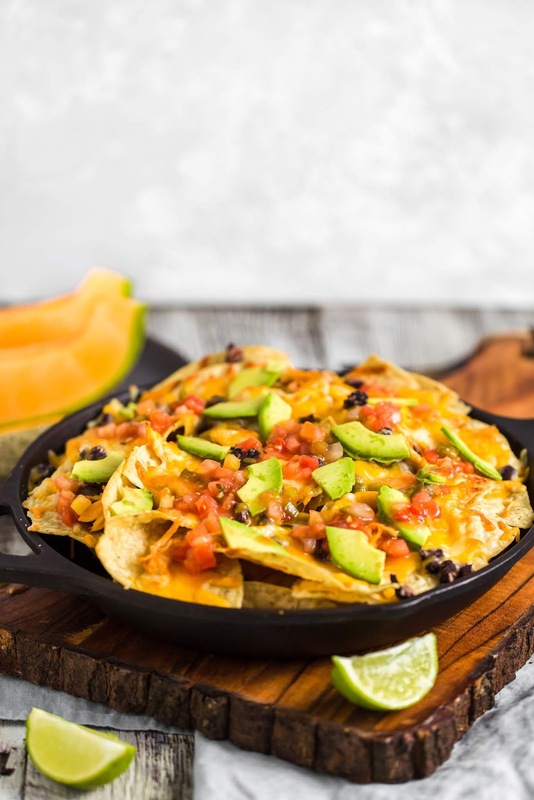 What I like to serve with these nachos is cantaloupe slices drizzled with fresh lime juice. - If you'd prefer to avoid store-bought rotisserie chicken, make your own pulled chicken in the Instant Pot. - If sour cream isn't your thing, simple drizzle the hot sauce on the nachos. And I do mean drizzle - that sauce is spicy! - If you want to make this ahead of time, you can create the chicken mixture and put it in the fridge the night before. Then all you need to do is layer your nachos, and pop them in the oven. 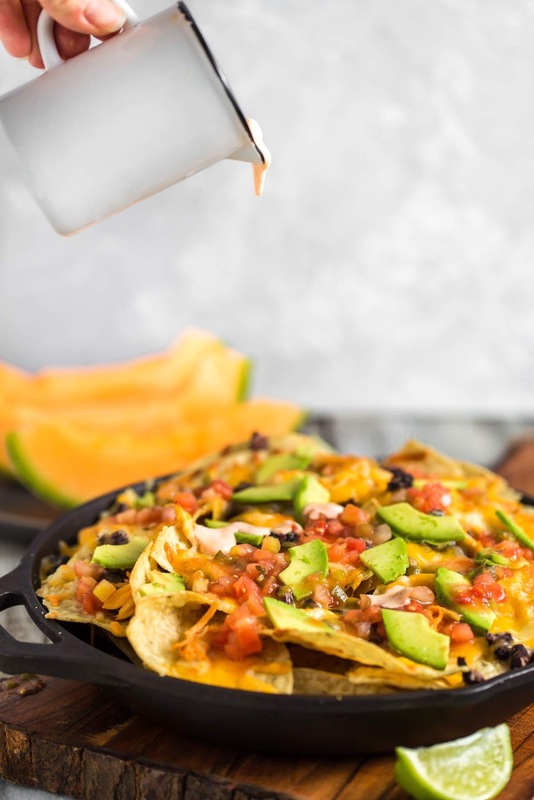 - This cast iron skillet is perfect for making nachos. Be sure to follow me on Facebook, Instagram, Pinterest, and Twitter, where I'll share even more quick and easy recipes! Want to receive delicious recipes in your inbox? Stir together 1/4 cup wing sauce, lime juice, salt, and chicken in a bowl. Arrange half of chips in a single layer on a parchment-lined baking sheet. Top with half of chicken mixture, half of beans, and half of cheeses. Repeat layers. Bake 10 to 15 minutes or until cheese is melted. Stir together sour cream and 1/4 cup wing sauce. Drizzle over baked nachos. Top with avocados and salsa. 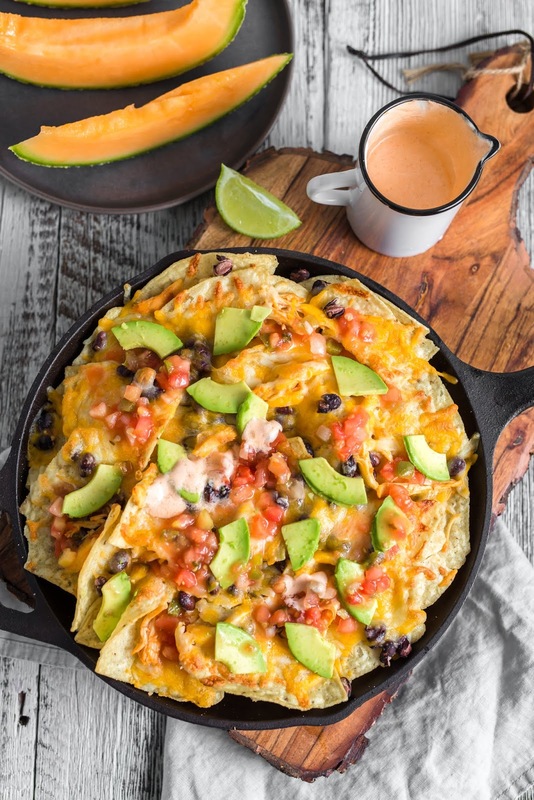 - A cast iron skillet is perfect for making nachos. I love buffalo chicken, and these nachos are delicious! So simple and so easy to put together. My husband and I love to snack on these after the kids go to bed! Buffalo chicken is one of my favorites! On nachos? Even better! Jyothi, agreed! Keep all the nachos to ourselves! Ha! Perfect timing. I have chicken leftovers from the dinner. I was just wondering how to use these leftovers. Your recipe is perfect. I have all ingredients. Can't wait to give this recipe a try.